Earthing (grounding) in the power grid or in the power system includes complexity measures and means that are undertaken in order to provide conditions for normal operation of the system, safe operation and movement of people and animals in the vicinity of the facilities which can come under voltage in normal or hazardous conditions. 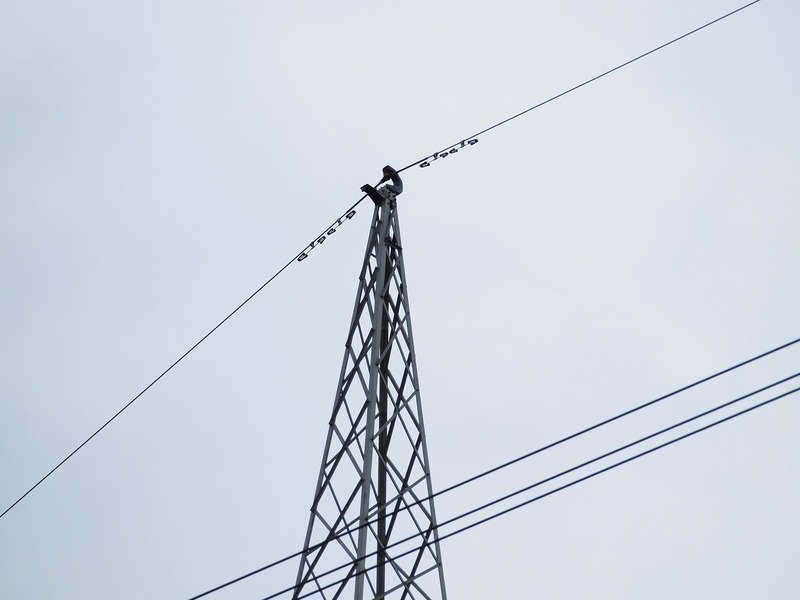 That complex set of measures also needs to ensure the protection of people and equipment from currents and voltages occurring during atmospheric discharges. Although these terms are sometimes used interchangeable, they present different aspects of protection. Protective earthing includes measures for protecting the metal parts that do not belong to the circuits, nor are they in direct electrical contact with them, but in the event of a defect, a voltage can arise. Earthing reduces that voltage and prevents the emergence of conditions that are dangerous to the equipment, as well as the lives of people handling that equipment or which can be affected by the defect or by moving in the vicinity. in the foundation of the object. The earthing is most commonly made of galvanized cast iron, copper, corrugated iron or iron topped with copper, and in some cases other materials can also be used. The grounding includes measures for protecting the part of the circuit, which provides the desired function or the working feature of that circuit. Grounding can be performed directly or indirectly. Direct grounding is carried out by direct connection of the grounding system. Indirect grounding is performed by binding to the grounding system through impedance (active resistance, inductance, capacitance, or combinations thereof). Lightning is the grounding of the lightning protection installation which serves to remove currents during atmospheric discharge. Lightning should limit the voltage on which the lightning rod comes, in order to prevent repeated surges in the electrical circuits and the metal objects. In most cases, the air terminals consist of a galvanized iron strips. 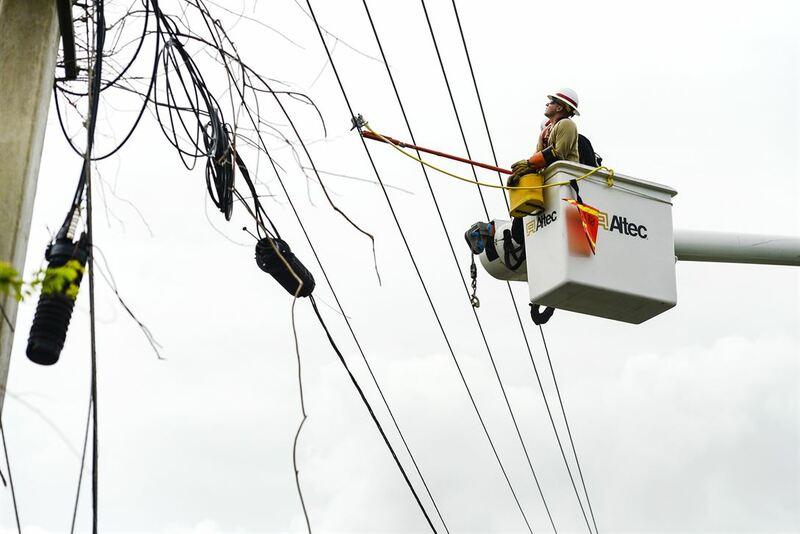 A strip is placed so as to make an electrical wire network, with the highest areas of the object covered. Also, if there are metal parts in an appropriate place, they can be used as air terminals that, if they are of sufficient size (have suitable electrical conductivity and thermal characteristics). Down conductors are in most cases galvanized steel strips, and if the prescribed conditions are met, the conductors can be replaced by metal parts that are located on the building. With them, the discharge current is applied to the ground through the grounding system. The grounding system consists of electro conductive parts in direct contact with the ground. In recent years, the use of foundation grounding has been high (a galvanized strip in the foundation of the building, electrically connected to the reinforcement). Earthing is characterized by the fact that a point of the plant belonging to the circuit is connected to the ground, so that the circuit itself is galvanically connected to the ground. Grounding, on the other hand, is characterized by the fact that the earth is connected to the point of a plant that does not belong to the circuit and which cannot come into galvanic connection with the circuit, but such a connection cannot be avoided in case of failure in insulation. Lighting protection serves to conduct the lightning current, i.e. the currents caused by atmospheric damping, by connecting the lightning installation with lightning rods. The lightning installation can be separate or connected with protective earthing (grounding). Earthing is used for the safety of the personnel operating the electric device, whereas grounding is used for protecting the power system. Earthing and grounding are entirety of measures and means related to system protection of electric shocks. Protective grounding is the grounding of metal parts that do not belong to the current carriage or are indirectly in electrical contact with them, but in case of failure they may come under voltage. Earthing is the protection of the part of the circuit that provides the desired function and / or operating characteristics of the circuit. It can be direct – by immediate connection to the grounding system, and indirect – by means of connection to the grounding system via impedance. Grounding also covers the lightning protection which covers the lightning installation. The lightning protection serves to conduct the atmospheric discharge current into the ground. The lightning installation should be dimensioned for the lightning impulse conditions, so it is also called impulse grounding. Consequently, the earthing continuously performs its function during the operation of the power system, while the lightning protection functions only for the duration of the overvoltage, and the grounding only for the duration of insulation failure. Emilija Angelovska. 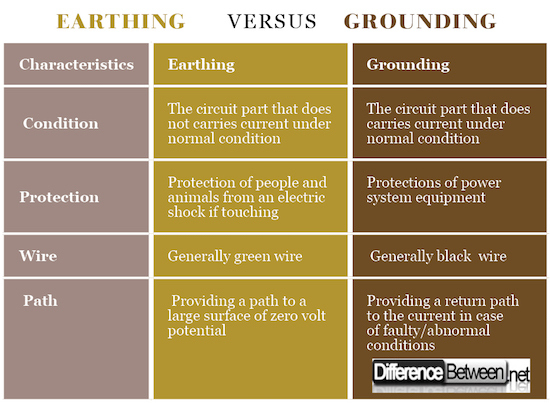 "Difference Between Earthing and Grounding." DifferenceBetween.net. February 22, 2018 < http://www.differencebetween.net/technology/difference-between-earthing-and-grounding/ >.